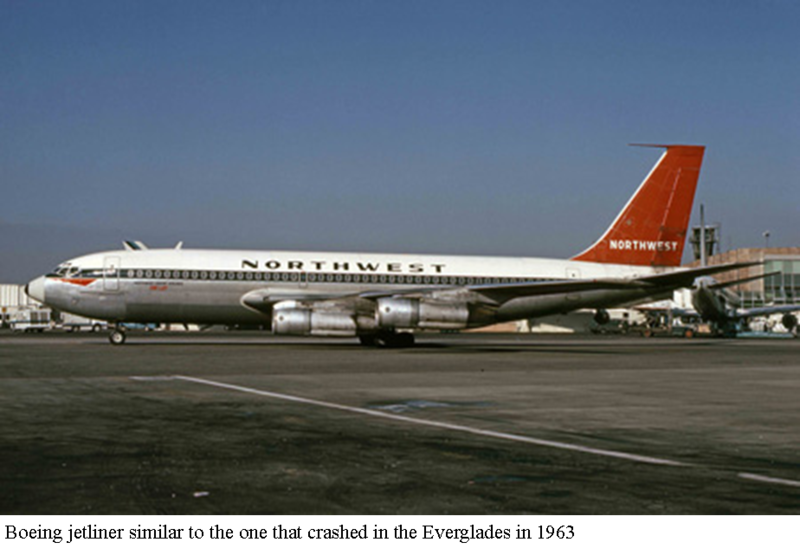 1963 – Northwest Orient Airlines Flight 705 crashed into a remote area of the Everglades shortly after takeoff from Miami International Airport on this date. The routine flight was destined for Portland, Oregon via Chicago, Spokane and Seattle when shortly after takeoff the plane experienced heavy turbulence due to severe thunderstorms in the area and broke up in midair resulting in the loss of all 43 people on board. This was the first time a jetliner had broken up in midair due to loss of control and turbulence, but it was not the last crash to occur in that area of the Everglades. Nine years later, Eastern Airlines Flight 401 crashed into the Everglades resulting in the loss of 101 passengers and crew, and in 1996 Valujet Flight 592 crashed near the same area of the Everglades shortly after takeoff due to a cabin fire. Rescue attempts for all three flights were further complicated by the remoteness and swampy conditions of the Everglades.